This is a continuation of a previous set of posts and is fifth in a series. If you’re not in California (or New England), don’t despair. Next chart. Yep, it’s the same Bubble. 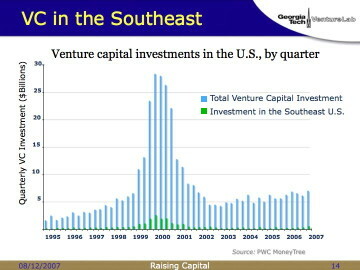 But this time, I’ve shown the amount of capital invested in the Southeast. It’s in green. Yes, it’s on the chart, smarty-pants! Okay, okay, next chart. Okay, I’ve increased the vertical scale. You can’t see the magnitude of the Bubble, but everything else is the same. 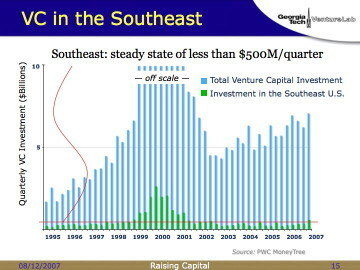 So, ignoring Bubblicious behavior, the Southeast seems to be relatively stable at about half a billion dollars per quarter. Is that good or bad? Glass half full: Half a billion dollars a quarter is a lot of money! Glass half empty: Yeah, but it’s peanuts compared to the rest of the country. Glass half full: Well, it’s more than your deal requires, so you should have no problem getting funded. Glass half empty: Since the Bubble burst, we’ve been relatively flat, in a national market that’s growing. That can’t be good. You make the call. But, no matter what, you probably should read the book Raising Capital When You Don’t Have A Silicon Valley Address by Keith Herndon. Go buy it now. I’ll wait. If you have an engineering background, you know that the real world works in logarithms. So I’m showing various amounts of capital on a logarithmic scale. Lots of entrepreneurs start out with debt. If you need $10K, put it on your Visa card. If you need $30K, second-mortgage your house. Either way, you’re not of interest to equity investors. It’s around the $100K point that most entrepreneurs (and their spouses) run out of resources to plow into their startup, and that’s the traditional territory for angel investors. 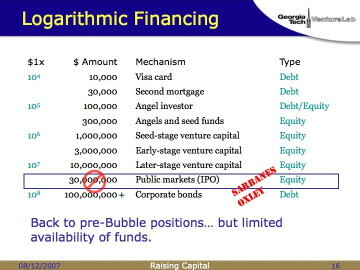 Some angels will do a mix of debt and equity, or maybe they’ll do a convertible note in order to not screw up the pricing of a future venture round. But if you need this kind of money, you’re probably either selling equity, or promising to do so soon. Refer to previous charts. 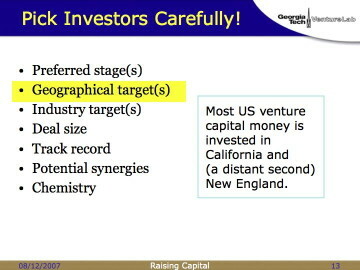 From $300K to $10M, you’re in the world of venture funds. Different funds will have different appetites for risk/reward, so you need to do your homework, but this is where VCs make their living. It used to be that, if you needed $30 million dollars, you were probably ready to take your company public through an IPO. The Sarbanes-Oxley Act of 2002 changed all that. You might get a flavor for how successful this act (often known as SOX or Sarbox) has been by noting that both Senator Sarbanes and Representative Oxley declined to run for re-election in 2006. The cost of complying with SOX 404 impacts smaller companies dis-proportionally, as there is a significant fixed cost involved in completing the assessment. For example, during 2004 U.S. companies with revenues exceeding $5 billion spent 0.06% of revenue on SOX compliance, while companies with less than $100 million in revenue spent 2.55%. 0.06% is barely noticeable. 2.55% can mean the difference between a profit and a loss. The Iron Law of Unintended Consequences has led to (1) many NASDAQ-traded companies choosing to “go private”, (2) other companies choosing to go public on foreign exchanges such as the London AIM, and (3) increased appetite for private equity by growing companies that choose not to go public at all. So, yes, you can blame SOX for the decline of New York compared to London as a financial center, and for hedge fund excesses! Net result for you: Since the IPO threshold is higher, VCs have fewer exit options, which drives down valuations of private companies all the way up the page. Deal with it. And write your congressman. Section 404 of the Sarbanes-Oxley Act of 2002 (15 U.S.C. 7262) is repealed. About to switch gears into a new section. More soon.